Despite their widely recognised negative consequences, energy subsidies have proven difficult to reform in many countries. Energy subsidies are fiscally costly, which can lead to higher public debt, or crowd out productive public spending (on education, health, or public infrastructure, for example). Energy subsidies damage the environment – getting energy prices right could reduce global carbon emissions by 24% and fossil fuel air pollution deaths by 57%. Energy subsidies are also a highly inefficient way of distributing income, with a large share of benefits captured by the rich (Coady et al. 2015). Raising energy prices to efficient levels could generate 3.5% of global GDP, thus creating valuable fiscal space to reduce inefficient taxes or expand priority public spending (Coady et al. 2017). But several recent developments have opened up a window of opportunity for reform. Sluggish global growth since the Global Crisis has put continued fiscal pressure on many economies. The sharp drop in international energy prices since mid-2014 provides a unique opportunity for energy importers to remove their subsidies on the one hand, while putting pressure on energy exporters to reform their subsidies as energy revenues fall on the other (Figure 1). The fact that over 190 countries submitted greenhouse gas emission reduction pledges (‘Intended Nationally Determined Contributions’) for the December 2015 Paris Agreement on climate change creates an additional impetus for change. Finally, there is a growing consensus on how to best reform energy subsidies, which can help to mitigate the social and political impacts of energy subsidy reform (Boersma and Griffiths 2016, Clarke 2015, Clements et al. 2013, Sivaram and Harris 2016). Source: IMF, WEO, and IEA. In this column, we take stock of recent developments in energy subsidy reform by examining an updated energy price database (we focus on diesel as its prices are readily available and are often the central focus of energy subsidy reform) and a review of specific country subsidy reforms. 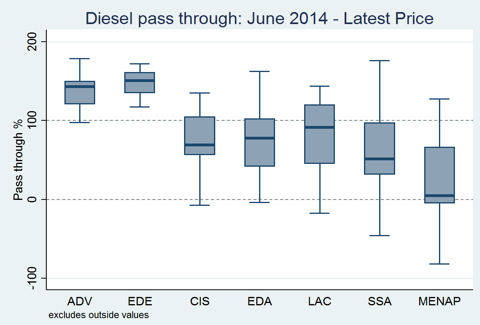 International diesel prices have experienced increased volatility since the end of 2006, with the most recent sharp decline starting around mid-2014. Pass-through coefficients – defined as the ratio of changes in domestic prices divided by changes in international prices – can help us understand how countries have responded to changes in international prices. Pass-through has varied substantially across regions, largely reflecting differences in energy pricing regimes (Figure 2). Advanced economies (ADV) and emerging European economies (EDE) typically have liberalised energy markets and fully pass through changes in international prices to the domestic market; indeed, pass-through is often greater than 100%, reflecting ad valorem taxation of energy consumption. Many countries in the Commonwealth of Independent States (CIS), Latin American and the Caribbean (LAC), Emerging and Developing Asia (EDA) and Sub-Saharan Africa (SSA) administratively set energy prices and have passed a much smaller share of the international price decline to their domestic energy prices. The Middle East, North Africa, Afghanistan, and Pakistan (MENAP) have the lowest pass-through, as many countries in the region administratively set energy prices, often at levels substantially below international prices, and rarely change them much in response to international energy price movements. Since many countries did not fully pass through the drop in international prices, energy subsidies – that is, the extent to which domestic energy prices are below international supply costs – have declined (IEA 2016, Coady et al. 2017). The regional pass-through of the decline in international energy prices is broadly similar to what has been observed in the past, with the exceptions of the CIS and MENAP regions (Figure 3). 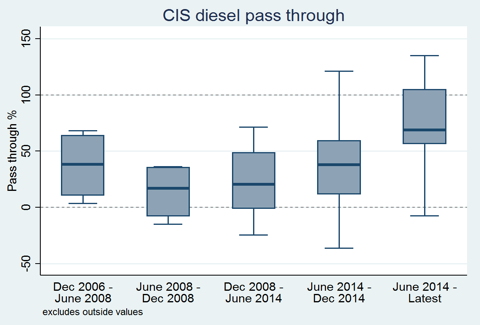 Pass-through in CIS during the most recent price decline has been higher than during the previous June-December 2008 period, when prices last dropped substantially for a short period of time. 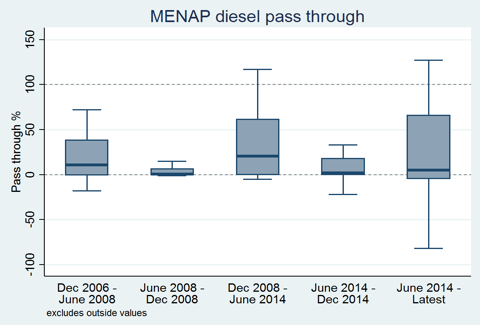 In MENAP, while pass-through during the most recent price decline has been similar to that during June-December 2008, a number of countries have actually increased prices – hence the negative pass-through coefficients – consistent with many countries initiating energy price reforms. Country-specific experiences can provide additional insights on the impetus for energy subsidy reforms. While pass-through coefficients provide important information on the evolution of energy prices, they may mask important developments in energy subsidy reforms. A large number of countries have actively reformed their subsidies since mid-2014 by raising energy prices – in contrast to the passive partial pass through of falling international prices – and also by introducing automatic pricing mechanisms, or by liberalising energy markets.1 Several important themes emerge after reviewing the details of the subsidy reforms in these countries. A large share of these countries are oil-exporting countries. Recent reform efforts have been concentrated in oil exporting countries. Out of the 40 countries listed in the previous footnote, 20 were oil exporting countries at the time of reform, including some countries that have traditionally been stalwart energy subsidisers. This is mainly driven by declines in oil revenues, which force exporting countries to consider broad fiscal reforms including energy subsidy reform. While some of these exporters initiated small fuel price increases prior to 2014 (Iran and United Arab Emirates), they have intensified their efforts in response to the lower oil prices. 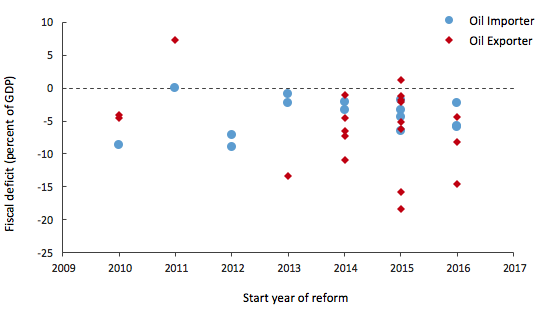 Most of the countries that implemented reforms faced large fiscal imbalances. While almost all countries that initiated energy subsidy reform had a fiscal deficit at the start of the reform episode, fiscal deficits in recent reform countries tend to be particularly larger and more concentrated in oil exporting countries (Figure 4). This suggests that fiscal imbalances are likely to be one of the main reasons for energy subsidy reform and could have important implications on the durability of reforms in these countries. Source: IMF staff reports, WB, WEO. Note: The fiscal balance shows the balance at the start of the energy subsidy reform. Climate-related reforms in Chile, France, Korea, Portugal, and South Africa are not included in the figure for consistency over time. Environmental concerns are also an important driver of energy subsidy reform in some countries. This includes countries that recently introduced a carbon tax (Chile, Mexico, and South Africa), raised carbon prices on top of the existing EU Emission Trading System (ETS) (France and Portugal), or introduced or plan to introduce their own emission trading systems (Korea; China has implemented several regional ETSs and is planning to set up a national ETS in 2017). An important consideration of China’s energy subsidy reform is to address deteriorating outdoor air conditions; further, environmental concerns and externalities of energy consumption were raised as part of the G20 fossil fuel subsidy peer review between China and US. Recent reforms tend to be better designed, drawing on lessons from past reforms and best practices. Many of these reforms have built on the six key ingredients for successful energy subsidy reform (Clements et al. 2013) and very few reforms involved only simple one-time price increases. A comprehensive communication campaign has been widely adopted as part of the reform strategy (Angola, Egypt, and Ukraine); some countries implemented automatic pricing mechanisms or liberalised energy prices to prevent the return of energy subsidies (under consideration in Bahrain, China, Cote d’Ivoire, India, Indonesia, Jordan, Madagascar, Mexico, Oman, Thailand, Tunisia, Ukraine, and United Arab Emirates); gradual and phased price increases were adopted by many countries (Algeria, Angola, Bahrain, Egypt, Jordan, Kuwait, Mozambique, Oman, Saudi Arabia, and Tunisia); and many introduced measures to mitigate the impact on the poor, strengthen the social safety net, or invest in health and education spending (Algeria, Angola, Egypt, Jordan, Morocco, Pakistan, Saudi Arabia, Sudan, Tunisia, Ukraine, and Yemen). In addition, some oil-exporting countries have considered energy subsidy reform as part of a broader economic reform to reduce their oil dependency (Saudi Arabia). A key concern is whether subsidies will re-emerge once international prices start to increase. On this front, there are some encouraging signs, but questions remain over the extent to which these reforms can be sustained. Not all the declines in international energy prices have passed through to domestic prices in many developing economies and, as a result, energy subsidies have declined. Reforms that are driven by long-term factors – such as environmental concerns – are likely to endure since these factors will not disappear in the near future. In addition, many recent reforms have been better designed to address their social and economic impacts and therefore are less likely to be reversed. On the other hand, reforms that are mainly driven by fiscal imbalances may not last as these conditions are temporary unless they are accompanied by deeper reform measures, such as adoption of an automatic fuel pricing mechanism, or even liberalisation. There has also been limited progress in advanced economies in bringing their energy prices to efficient levels. Boersma, T and S Griffiths (2016), “Reforming energy subsidies initial lessons from the United Arab Emirates”, The Brookings Institution. Coady, D, I Parry, L Sears and B Shang (2017), “How large are global fossil fuel subsidies?”, World Development, 91: 11-27. Coady, D, V Flamini and L Sears (2015), “The unequal benefits of fuel subsidies revisited: Evidence for developing countries”, Chapter 14 in B Clements, R de Mooij, S Gupta, and M Keen (eds), Inequality and Fiscal Policy, International Monetary Fund. Clarke, K (2015), “Diesel subsidy reform in India: Lessons learned”, The International Institute for Sustainable Development. Clements, B, D Coady, S Fabrizio, S Gupta, T S Coleridge Alleyne, C A Sdralevich, (2013), Energy Subsidy Reform: Lessons and Implications, International Monetary Fund, Washington DC. IEA (2016), “World Energy Outlook 2016”, International Energy Agency, Paris. Sivaram, V and J M Harris (2016), “Sustaining fuel subsidy reform”, Discussion Paper, Council on Foreign Relations. These include, to the best of our knowledge, Algeria, Angola, Argentina, Bahrain, Cameroon, Chile, China, Cote D’Ivoire, Ecuador, Egypt, France, Gabon, Ghana, India, Indonesia, Iran, Iraq, Jordan, Kazakhstan, Korea, Kuwait, Madagascar, Mauritania, Mozambique, Malaysia, Mexico, Morocco, Nigeria, Oman, Portugal, Qatar, Saudi Arabia, South Africa, Sudan, Thailand, Trinidad & Tobago, Tunisia, Ukraine, United Arab Emirates, Venezuela, and Yemen.